Biometric data kit: Update on project development. 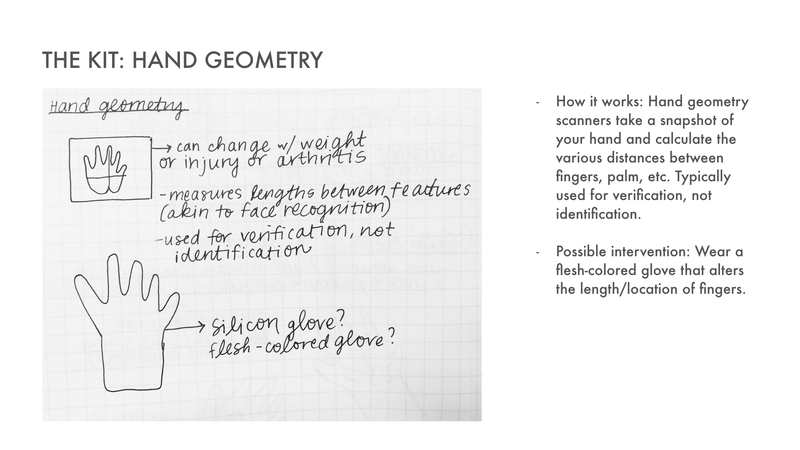 This week, Shir and I have been discussing the biometric anti-surveillance kit that we will be building for our midterm project. 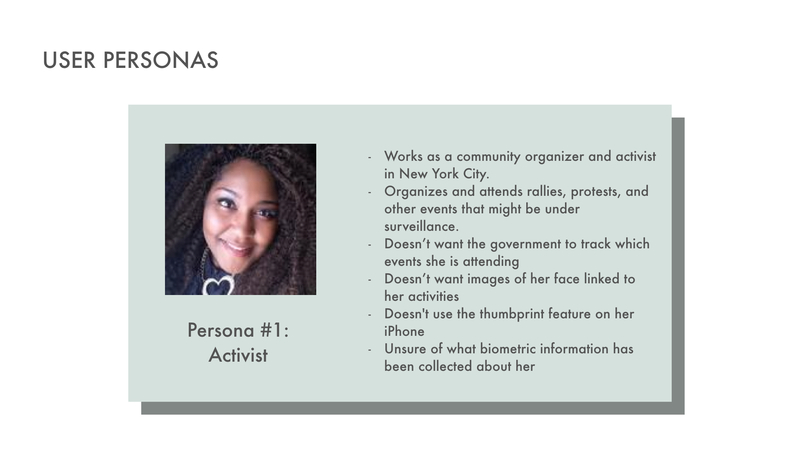 Biometrics are the measurable, distinct characteristics that are used to verify the identity of individuals, including groups that are under surveillance. Biometric data includes fingerprints, DNA, face recognition, retina scans, palm veins, hand geometry, iris recognition, voice, and gait. Biometric data is extremely sensitive. If your data is compromised, it’s not replaceable (unlike password tokens). The widespread collection of personal, biometric data raises questions about the sharing of such data between government agencies or private companies. Many of us use the Apple Touch ID on a daily basis and yet we don’t think about the fact that Apple now has access to a snapshot of our fingerprint. 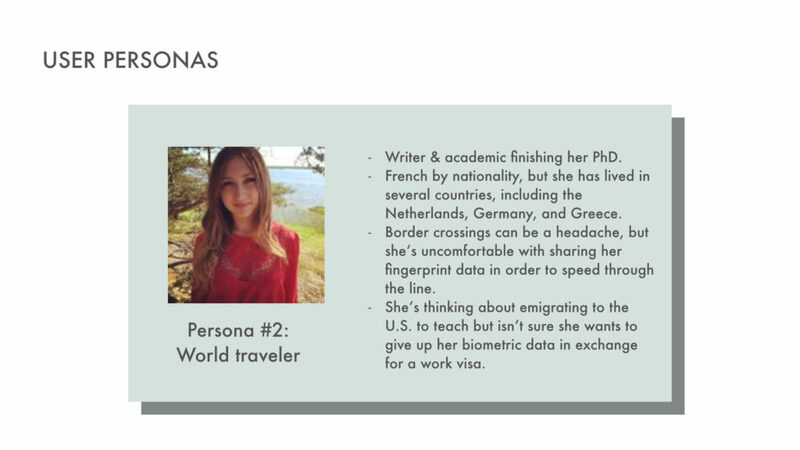 In addition, biometric data is most often collected by the state about populations that are already vulnerable, including criminals, travelers, and immigrants. 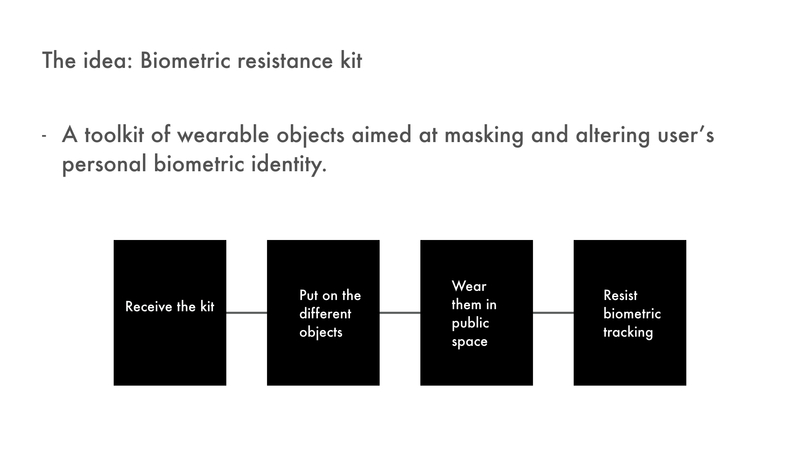 We intend to put together a biometric resistance kit, a toolkit of wearable objects aimed at masking and altering user’s personal biometric identity. 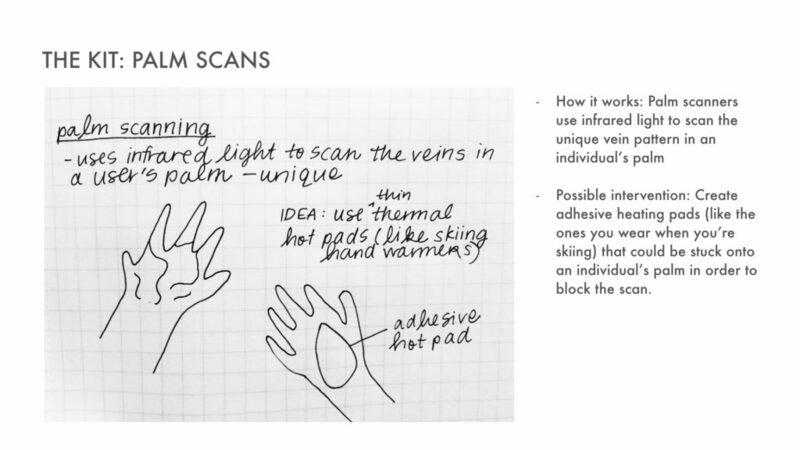 The aim of the project is to prototype non-intrusive objects that can be worn by anybody to protect their biometric identity in public spaces. We had several ideas of what the kit could contain. 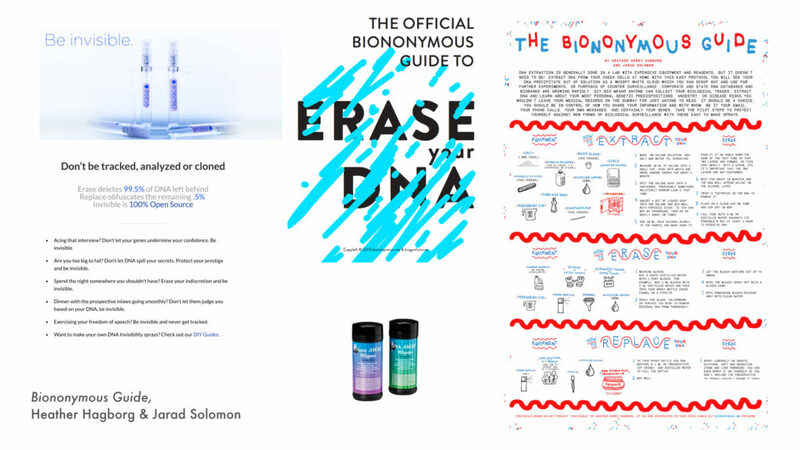 We researched what had been done in the past and found several other artists and engineers experimenting with anti-surveillance materials. 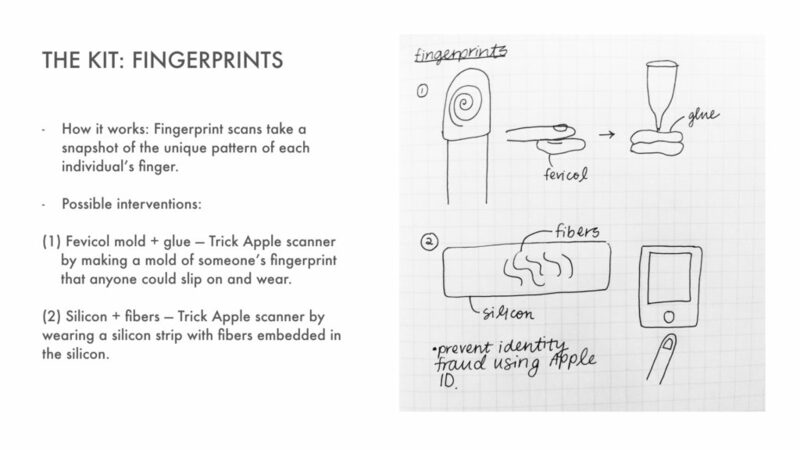 Identity is a project by Mian-Wei that uses a band-aid made of silicon and fibers to trick the Apple Touch ID into thinking it’s a real fingerprint. The solution is simple and effective, something we would like to achieve with our project. Biononymous Guide is a series of DIY guides for masking your biometric identity (specifically, DNA and fitness trackers). 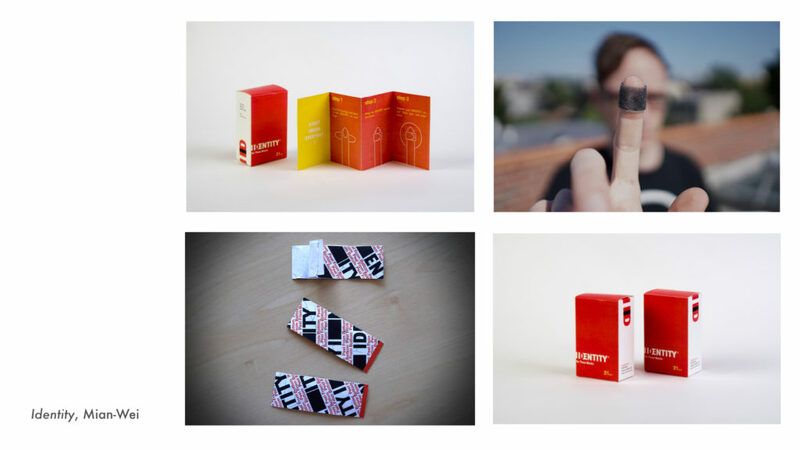 We loved the format of the website – the mix of printed materials, physical objects, and how-to videos match the kind of kit we’re hoping to build. 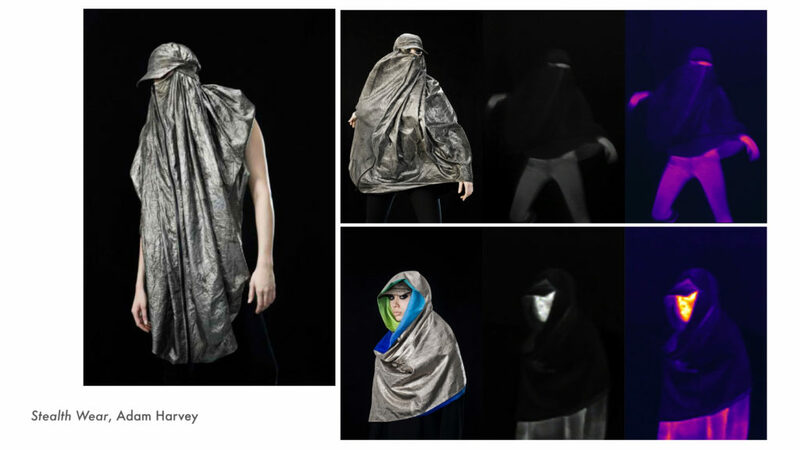 Adam Harvey is an artist whose anti-surveillance work includes Stealth Wear, a line of Islamic-inspired clothing to shield against drone attacks & thermal cameras, and CV Dazzle, a makeup guide that beats facial recognition algorithms. We loved how he tried to work with styles that people would actually want to wear. This will likely be a major concern in the development of our project. We’ve spoken with a few experts in the field of biometrics, surveillance, and facial recognition algorithms and are planning to continue these conversations. First, we spoke to Nasir Memon, a computer science professor and biometrics expert at NYU’s Tandon School of Engineering. 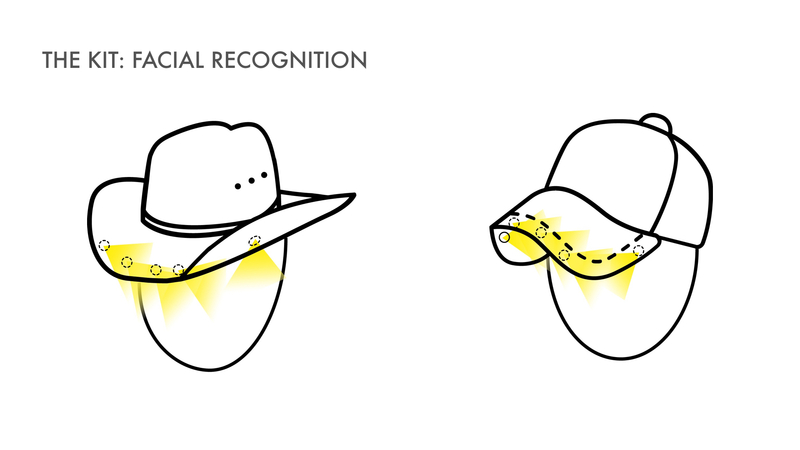 He had some ideas for the kit, including a hat with infrared lights that would beat facial recognition algorithms. 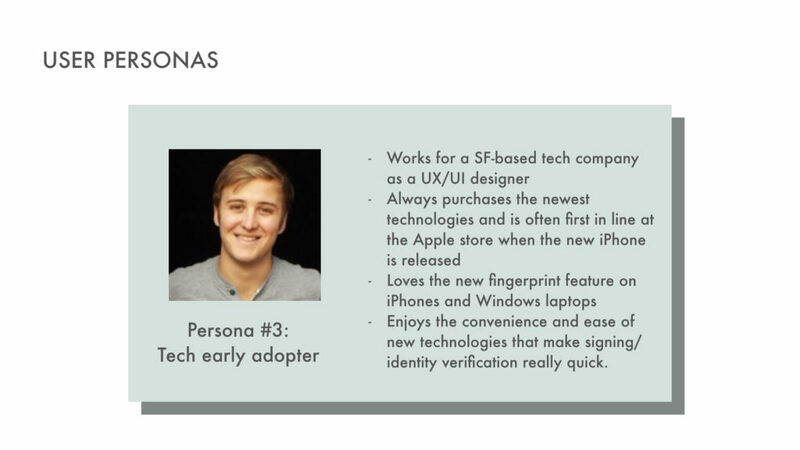 We also spoke to NYU engineering students who are researching surveillance, machine learning, and biometrics. 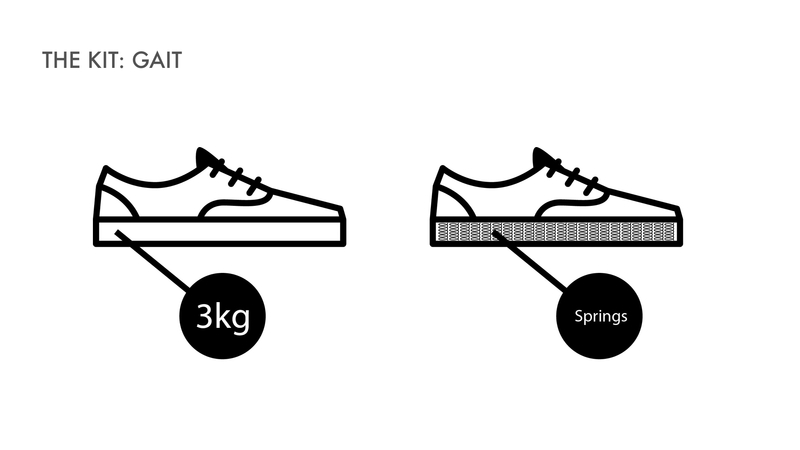 They gave us additional technical guidance about what in our kit would be most viable. We also have set up meetings with artist Adam Harvey and NYU professor Eric Rosenthal to discuss our project idea. Previous Previous post: Project proposal redux. Next Next post: Project update: Algorithmic gaze.